Wirrn Dawn is a game of two halves. The second episode is far stronger than the first. The Wirrn, of course, made their first (and so far only*) appearance in Doctor Who in The Ark In Space and some of the themes of that story are reflected in Wirrn Dawn but it also adds elements of its own making the Wirrn much more 'sympathetic'. Their lifestyle might seem disgusting to us but it's part of nature. The Wirrn are the Wirrn because the universe made them that way. They're driven by natural inclinations, not 'evil'. That doesn't reduce the horror of what they do though and the human to Wirrn transformation process is not glossed over at all. There is pain here. Pain and fear. In fact the one thing that comes through in this story is fear. Whether that's fear of the past, fear of death or change. The other thing, maybe the flipside of fear, is survival. The Wirrn survived, the 'Indig' survived sharing a planet with the Wirrn, the Doctor survives and wants to survive. Survival of the fittest. It's a small cast story this. There's the Doctor and Lucie. I love Lucie Miller in this. She's pugnacious above and beyond the call of duty. Standing up to Salway (Colin Salmon) even as he's waving a massive gun at her. I love the way she recalls Rosto too as she's trying to convince the Wirrn not to kill her. Salway and Delong (Daniel Anthony) are Galsec troopers. Farroll (Liz Sutherland) is a Galsec Admiral whose fleet takes a bit of a beating early in the story. Salway's a bully, (possibly) a coward and a racist. Delong is a kid. And an Indig kid at that, which means Salway feels he has a licence to bully him. Indig seems to be a slang word for the original human settlers of various planets. A snide, snarky unpleasant way to describe those people that Galsec is over-taking. Galsec (or should it be GalSec...anyway) are at war with the Wirrn but it doesn't look like a war either side is going to win without massive casualties and a lot of unpleasantness. It seems the first settlers on this planet - the name of which has escaped me - never fought the Wirrn. This story it turns out is the story of how they survived, which the Doctor seems to have worked out for himself before the story ends. Paul McGann is apparently an incredibly laid back kind of chap and sometimes that spills through into his portrayal of the 8th Doctor. In this story he's so chilled out you could break him into little pieces and add them to your drink. So relaxed that he takes a rather large gamble based on an educated guess which will put everyone at risk. But that's a very Doctor-ish thing to do. He just does it in a superbly relaxed fashion hardly ever raising his voice, just adding a little urgency here and there. It's rather lovely. So after all that rambling what do I think. I enjoyed it. It's nice when a story doesn't have an out and out bad guy, just a range of possible bad guys. It's nice to hear the Wirrn back with that distinct sort of squeaking creeping sound. Oh and there's a little seed sown about Lucie's relationship with the Doctor when she's arguing with Solway about the dangers of putting the Doctor on a pedestal. I wonder whether that will pay off later? *Not counting the Wirrn Corpse in Shada (?) 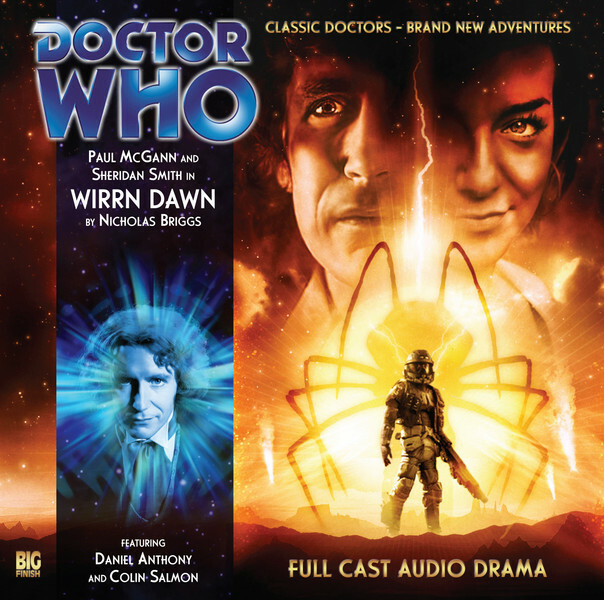 , a novel and at one other Big Finish story, Wirrn Island.